An expression of sympathy that?s tasteful, dignified and with a beautiful sensibility that conveys your feelings with warmth and sincerity. 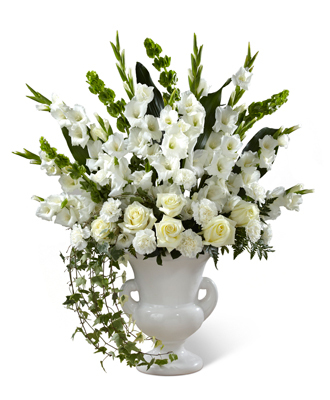 This generously-scaled arrangement makes a superb choice with hand-selected white gladioli, carnations, roses and Bells of Ireland complemented with lush greenery by a local artisan florist and arranged in a classic white ceramic urn. Its comforting presence and impressive scale makes a fitting tribute for a wake, the funeral service, or to add a note of serene consolation to a graveside service. Style of container may vary. Product is not appropriate to send to a residence.